Home Renovations can increase the value of your home. Updated bathroom or kitchen, new hardwood floors, or energy efficient solutions all are valuable ways to add value and enjoy the benefits of your hard work. There are various mortgage products suitable for home renovations. Line of credit as a 2nd mortgage or a stand alone 2nd mortgage. For refinancing there’s fixed and variable mortgage products from 1 to 10 years. 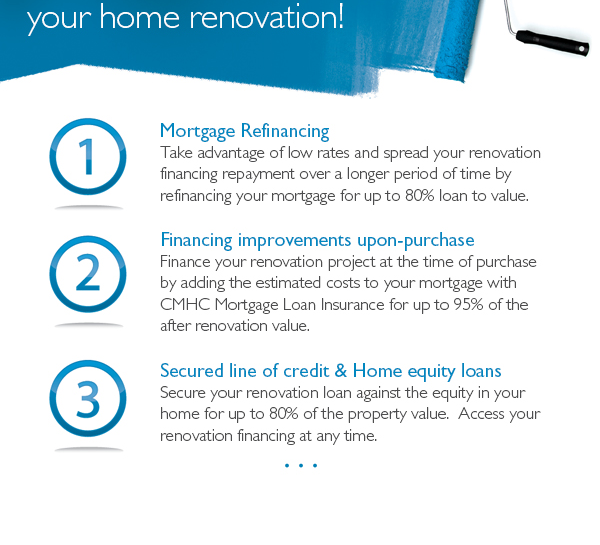 Home renovation loans or mortgages priced based on the borrower’s credit profile. For good credit you can review current mortgage rates here. For less than perfect or bad credit, you can see the alternative mortgage rates here. Planning on a home renovation project? Be sure to contact us and discussing your requirement. We would be happy to help.